The loot system can be used for more complex, level based item gains and special condition loot. Until now we’ve used the start inventory of the combatants for item loot. In this tutorial, we’ll change Evil Pant‘s loot from the start inventory to loot tables and add a special one time item loot. Open the ORK Framework editor and navigate to Combatants > Loot. Here, we’ll change the default loot settings to match Evil Pant‘s start inventory – change the following settings. The Loot settings consist of different Loot Tables. A loot table defines the loot (i.e. items, weapons, armors and currency) when the combatant is within a defined level range. 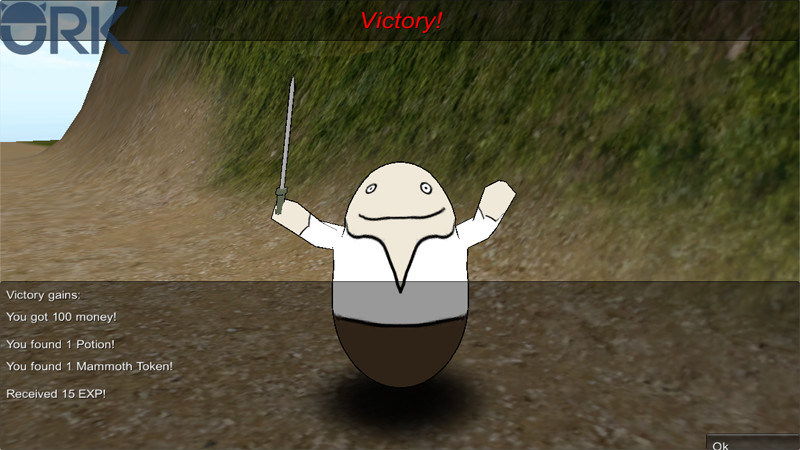 Each loot table defines a level range – the first loot table matching the combatant’s level will be used. There is already a default loot table added, so let’s change its settings. The level range settings are already good as they are, but let’s check them anyway. You can base the loot also on the combatant’s class level. Loot tables can also depend on Variable Conditions and set variables after dropping – we’ll look into that for the special loot, but first let’s finish the standard loot. Here we’ll define the actual loot of the loot table. We want to set it up to match Evil Pant‘s start inventory, so change the following settings. Click on Add Item to add an item to the loot table. Click on Add Item again to add another item. And that’s it for the standard loot for Evil Pants. Now we’ll add a special one time loot – we’ll add a valuable, rare item that is dropped with a low chance and will only be dropped once in the entire game (we’ll do that using game variables). Add a new Loot setting and change the following settings. Click on Add Loot Table to add a loot table. The variable conditions make sure that this loot is only dropped when the conditions are valid – in our case, it will only be dropped once in the game. You can also use object game variables of the combatant or its spawn point. Click on Add Game Variable to add a condition. We’ll check for the global bool game variable tokanDropped to be false in order to use this loot table. Here we can define game variables to be set after the loot table has been used/dropped. This makes sure the game variable will only be set if something was dropped. Click on Add Game Variable to add a condition. We’ll set the global bool game variable tokanDropped to true. And that’s it for the loot settings. Now it’s time to update the loot settings of Evil Pants. Navigate to Combatants > Combatants and select Evil Pants and change the following settings. If enabled, a random loot setting out of the added loot will be used. In our case, we want the standard loot and special loot to be used at the same time. Click on Add Loot to add a loot setting. Click on Add Loot again. Open the main menu scene (0 Main Menu) and hit play. Leave town and get into some battles with Evil Pants. If you’re lucky, you’ll get a Mammoth Token, but only once. And that’s it for now – the next lesson will cover the bestiary system. Tip: You can also use Loot in Box type Item Collectors to fill the item box using the combatant for level and status requirements.